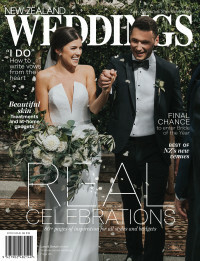 New Zealand Weddings magazine presents the 2018 bridal runway show! BUY TICKETS NOW BY CLICKING HERE. Revealing show-stopping wedding trends for the bohemian bride all the way to the contemporary soon-to-be Mrs, this is the perfect opportunity for an up-close and personal look at the stunning creations of top bridalwear specialists Jessica Bridal, Elizabeth May , Modes , Alma Wong and Margaret Wray. LoneDaisy will revealing romantic lingerie options and Barkers menswear making sure the groom is stylishly sorted. For finishing touches, Wicken Jewellery will adorn brides with beautiful stones and enchanting design.